Youre visiting Hamburg Metal Dayz 2018 and are looking for something to do before the doors open on Saturday September 22? 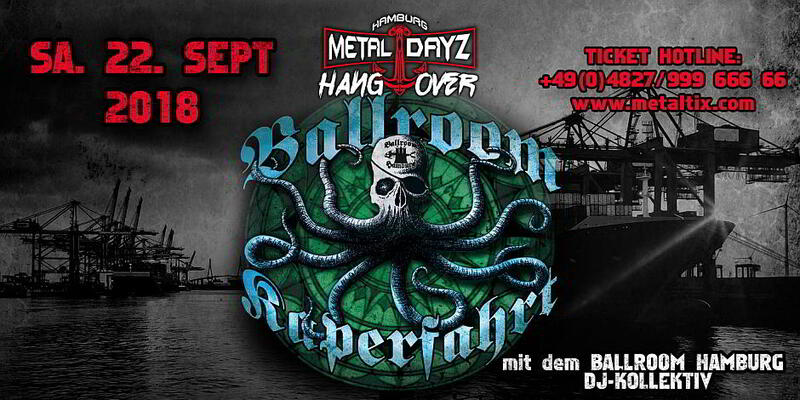 How about a boat trip with the metal djs of Ballrom Hamburg? Well follow-up on last years successful premiere and enter the cosy "Barkasse Tanja". Boarding start at 12:30 PM at Landungsbrücken (Brücke 6/7), the trip starts at 1 PM. Well be cruising for two hours with the finest metal tunes and tasty drinks before we anchor at Schiffansleger Messberg at 3 PM. From there you can stroll to Markthalle and start into the second day of Hamburg Metal Dayz! Tickets are available for € 20 (plus fees) from www.metaltix.com! with: Skindred, Beyond The Black, Audrey Horne, Jesper Binzer, Bonfire, The Hirsch Effekt, Ondt Blod, Sibiir and more!